Well today (Friday) was test day. 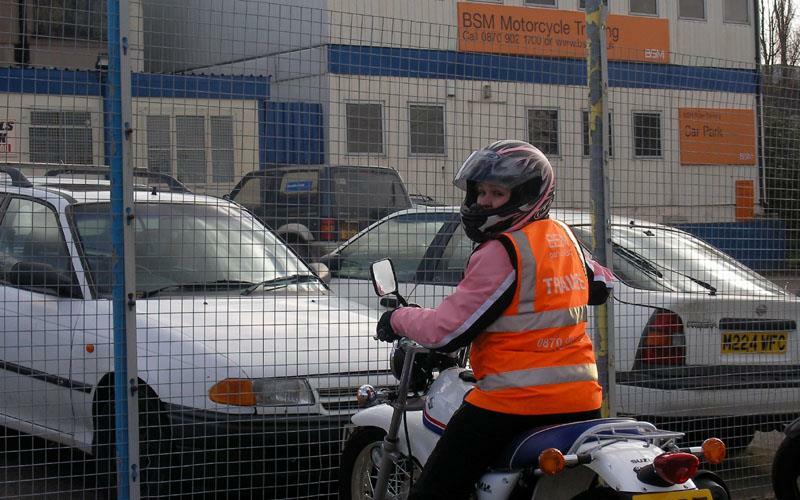 I arrived at the BSM centre at 9am and today I was to be looked after by Chris, one of the other full-time instructors, as Mark was doing a CBT in Birmingham. Also spending the day with me and Chris was Butch, an American who was on his third attempt at passing his test on a Honda CB 500 on the regular BSM Direct Access course. 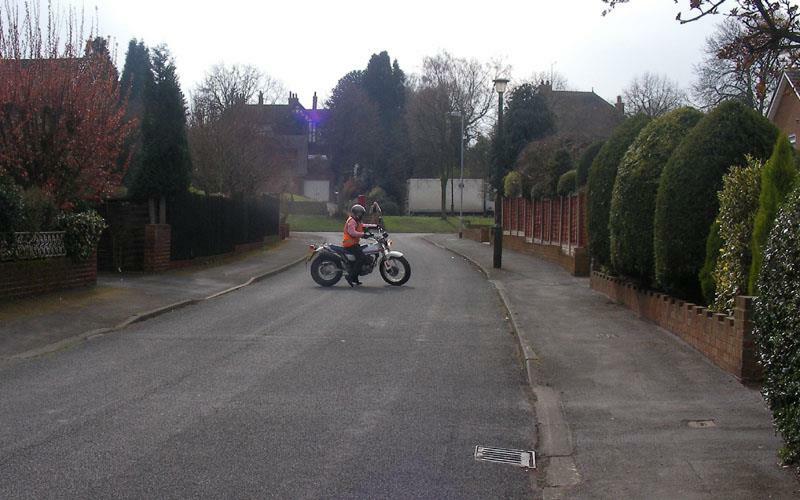 After filling the motorcycles up with petrol, we were off to Lichfield for a bit of a practice before my test at 1.30pm. As it was quite windy again and Chris was keen not to tire us out before our tests, we took the scenic route and instead of heading straight down the A38 we took to the A446 which goes out towards the Belfry gold course. When we got to Lichfield we had a bit of a ride around the area before going to one of the roads they use for the big bike u-turns. After all my problems, Chris thought it would be a good idea to get me to have a go at a few and as it was a much wider road they use for the big bikes, I had no problem on my Suzuki Van Van, which was nice for my confidence. Poor Butch though was doing a Sarah and finished up on the floor several times. I knew exactly what he was going through and was willing him on from inside my helmet. Once Butch had managed s few we went further down the road to try a few emergency stops which I had no problem with. Chris put in an extra couple of U-Turns so we could try more emergency stops – very sneaky! As my test was at 1.30pm and Chris was keen to get me there in plenty of time, we headed to Morrisons just after 12 for a sandwich. I’d been there yesterday with Mark so now I was trying to guide Chris and Butch in an unfamiliar town – talk about the blind leading the blind, but we made it. We got to the test centre and then the worst thing happened, my nerves kicked in. Oh god, no! When the examiner called me we went in to a room for me to show him my driving licence, CBT certificate and theory test certificate and so that I could get a radio for him to talk to me. We then went out to the Suzuki Van Van where asked me to tell him how you loosen or tighten the chain and also show him how I check the lights work, which I did successfully. All I wanted to do was get out there and get this flipping U-Turn out the way. If me and Kay got this, then I was sure I would pass. It wasn’t long before I was asked to turn left in to a road and pull over. Then the examiner got off his BMW and came to me to ask me to firstly walk the Van Van round to show I could turn in that space and then perform the turn in the shape of a U. Mark had advised me to use the walking round bit to pick my spot to use as my fixed point to watch, so I chose my lamp post and got back on. The road was much wider than I’d been practising on and I managed it almost perfectly. Well I got it round and didn’t stall, fall off or mount the curb, so I considered I’d done it, although I did pick up a minor for being a little wobbly but I didn’t mind that after all the failed attempts. Back on the road I talked to Kay and told her she’d done me well and off we went. The emergency stop was actually in exactly the same place I’d been doing them with Mark yesterday. When I got to the road and the examiner told me what he wanted me to do I was pleased as I knew he was going to send me around the block to come back at him at speed. Mission accomplished! We then set off from the housing estate where we’d been and out of Lichfield to the dual A38 carriageway and back in to Lichfield. I was pleased as I managed to tuck in and get to 53mph on the dual carriageway before we exited and went back in to the town and it seemed that we were heading more or less straight for the test centre. 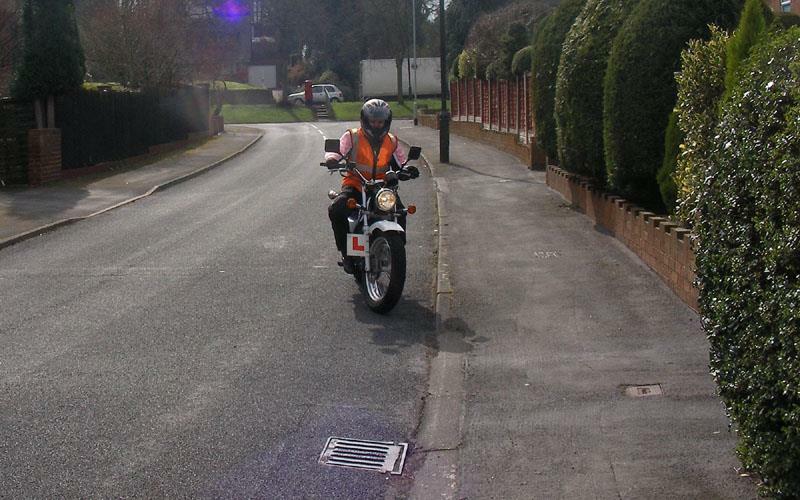 When we got back I was asked to tell the instructor how carrying a pillion would affect the balance – so I said about the centre of balance being moved up and backwards and that it increased the time it takes to brake and accelerate. My final question was what would you need to change when carrying a pillion – my reply was increase the rear tyre pressure, alter the lights, mirrors and suspension. All correct. Then to my utter dismay I was told I’d failed. I was totally gutted and still am. Apparently I had made a dubious move with a lorry at the roundabout before the dual carriageway, and I was supposed to do 70mph. Both Chris and Mark were gutted for me but convinced me to retest as soon as possible – so unfortunately for them they’ve got me back in a couple of weeks. Sorry guys that I let you down. Still I’m not giving up riding and neither should anyone reading this.